An aggressive Alberta clipper will limit travel on Monday night into Tuesday night. Snow will develop ahead of an area of low pressure that will emerge into the Dakotas later tonight. This system will then dive southeast before making a turn to east. At the point of this turn or pivot, heavy snow is likely. Amounts on the order of 3-6" for many locations is reasonable. The snow will fall much of the day Tuesday for those in the darker shades on the map, and accumulate quickly in a light and fluffy fashion. The storm moves out by Wednesday morning. Winter weather advisories are in effect for millions of people Tuesday. They will get expanded into Michigan likely later this afternoon. 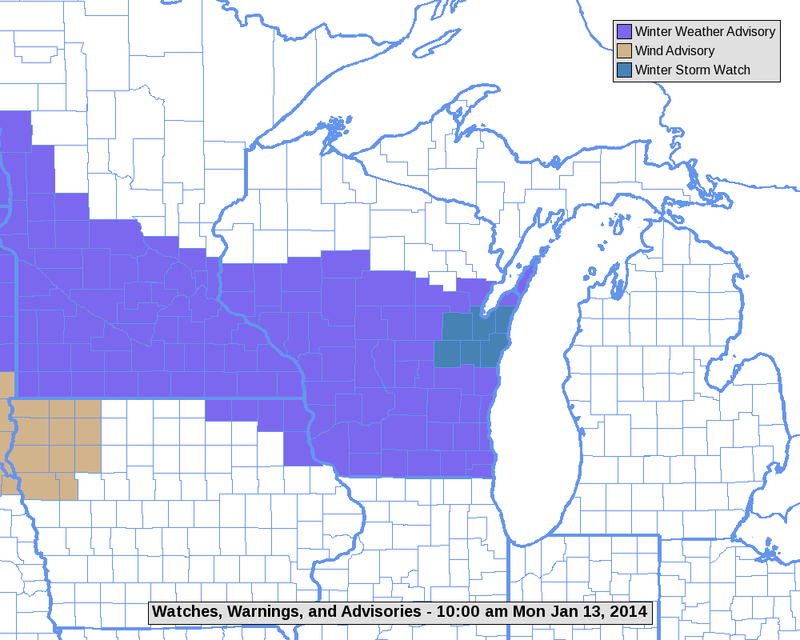 Furthermore, there is a winter storm watch for parts of eastern Wisconsin, where over 6" of new snow is possible. This axis of heavy snow will also extend into Michigan. Along with the new snow, winds will pick up slightly, some minor blowing and drifting is also likely. 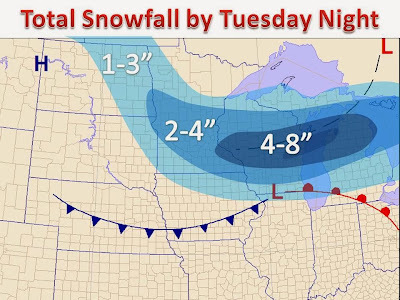 Be sure to check back here later this evening for an update on the first significant accumulation in over two weeks for these areas!